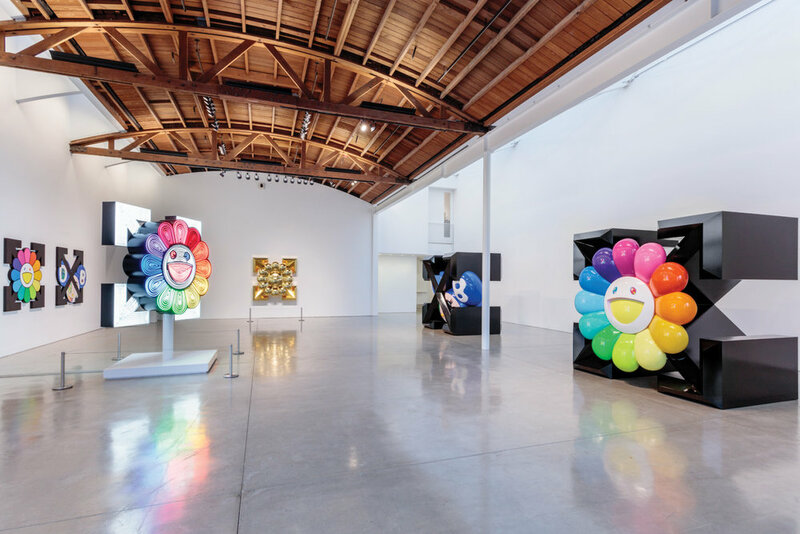 Japanese Street Art darling turned Pop-Design Prodigy, Takashi Murakami shines with his new show titled “AMERICA TOO” at Gagosian in Beverly Hills, California; showcasing an ongoing creative partnership with Louis Vuitton’s new Menswear Director, Virgil Abloh. Takashi Murakami’s opening reception at Gagosian in Beverly Hills last night was nothing short of electric. The Japanese Street Art darling turned Pop-Design Prodigy produced a collaborative show titled “AMERICA TOO” showcasing an ongoing creative partnership with Louis Vuitton’s new Menswear Director, Virgil Abloh. The result is eye candy with a side of digitalism and a shot of cultural awareness. In other words, a perfect synopsis of the art show’s time and place. To be clear: Takashi Murakami is a Louis Vuitton alum; his 2008 Murakami x Louis Vuitton collaboration has been a long time favorite for the sneakerheads and raw denim devotees of the Superfuture and Hypebeast ilk. This partnership at the Gagosian comes on the 10-year anniversary of the Louis Vuitton collection, and follows the times with an art-first perspective. After an extremely successful recent partnership with Supreme, it only makes sense that the luxury brand would continue to hone in on this group of collectors possessed by coolhunting. If you ever owned a pair of Nike’s Tiffany & Co. Dunks, this exhibition is for you. Polychrome petals and LED projections permeate the gallery walls, sending waves of youthful energy into the Gallery-institution in the Golden Triangle. In a way, the Gagosian’s Rodeo Drive adjacent location inform the level of artificiality that is celebrated in the show. There is no shade of cynicism, and the sense of pure positivity is one of the show’s greatest strengths. Artworks such as Monolith Flower & Arrows, a glossy rainbow-daisy sculpture of grand proportions stand out with a grin. The works facilitate auto-optimism in the viewer on all levels. Considering the state of the union, it is a well-timed oasis of high vibration visuals. Hip-hop legend Drake seemed to agree, having purchased the piece in the show’s opening hours. The ‘Flower Power’ series paintings, which are on display in both townhouse and penthouse friendly size scales, give the show an even greater context within the artists’ international repertoire. A symptom of Los Angeles ‘peace & love’ syndrome, the series takes ownership of its superficiality and transforms it into a message of hope and togetherness. Utilizing a similar technique to fellow artist and friend of the studio, Murakami’s ‘Hollywood’ piece reminisces Shelter Serra’s Disney Castles. In fact, the artists had communicated about a possible purchase of Serra’s work in the months leading up to the show; the studio confirmed the purchase of his Disney Castle ‘Mirage’ the date following the opening. Art is at its best when in dialogue with similar artists, as any art historian or critic will agree. Their halftone renderings of Los Angeles landmarks mimic the prismatic sense of reality that reflects many aspects of American culture today; with fractured politics, social media distractions and artificial intelligence on the rise, how could one function without a rose—or rainbow—colored lens? To decline to mention the line for entry stretching the entire length of an LA city block would be shortchanging both the artists and the gallery. Attendees included Travis Scott, Drake, Kourtney Kardashian, Usher, Kid Cudi, Derek Blasberg, Orlando Bloom and of course, the artists themselves. While the show, “AMERICA TOO” displays pure Superfuturism, the artist has not dropped his Street Art roots. His recent mixed-aerosol installation in Downtown LA mega-exhibition titled ‘Beyond The Streets’ was the central fixture of the warehouse’s main hall. Seeing his work next to artists with the same mother tounge such as André Saraiva, Shepard Fairey, Timothy Curtis and BANKSY; to name a few, reminds us that Street Art as a genre is built on community, interplay and mutual respect. A message, it seems, America could use a reminder of. Takashi Murakami x Virgil Abloh’s show “AMERICA TOO” is on view at Gagosian Beverly Hills (456 N Camden Dr.) through 25 October 2018.